Our Imposing Victorian Sixteen Bedroom Hotel is ideally situated just five minutes from Seascale Golf Club, standing just 50 yards from Seascale Beach with its spectacular Coastal Views. Facilities include; Stylish Contemporary and Traditional en-suite Bedrooms with Digital Colour Television, Tea and Coffee making, Full English Breakfast. We are privileged to be included once again in the 2013 edition of the Good Beer Guide regarded by many as the best publication for the real ale drinker. West Cumbria CAMRA society meet regularly at Calder House and voted us Pub of the Season August 2010. Guest ales that regularly appear with us include National Award Winner, Loweswater Gold brewed by Cumbria Legendary Ales. Geltsdale Brewery - Aurora Bitter from Carlisle, Cross Bay Brewery - Nightfall - brewed in Morecambe, as well as hosting beers from all parts of the UK. Wine and dine in our beautiful Victorian dining room overlooking Seascale beach and enjoy spectacular views of our western coastline. 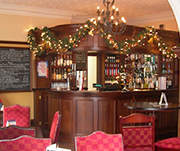 As with Chapters Bar , Chamberlain's offers a full mouthwatering menu and 'specials of the day'. For that special occasion Chamberlain's can be hired for your private function with seating for twenty people we will be able to cater for your party, birthdays, anniversaries, or just a get together.